A specialized municipality is a type of municipal status used in the Canadian province of Alberta. Alberta's specialized municipalities are unique local governments formed without the creation of special legislation. They typically allow for the coexistence of urban and rural areas within the jurisdiction of a single municipal government. for any other circumstances that are deemed appropriate by the Minister of AMA. Applications for specialized municipality status are approved via orders in council made by the Lieutenant Governor in Council under recommendation from the Minister of AMA. Alberta has five specialized municipalities that had a cumulative population of 178,598 and an average population of 35,720 in the 2011 Census. Alberta's largest and smallest specialized municipalities are the Strathcona County and the Municipality of Jasper with populations of 92,490 and 4,051 respectively. 44 elected officials (four mayors, one reeve and 39 councillors) provide specialized municipality governance throughout the province. An order in council to incorporate any municipality must give the municipality an official name. Of Alberta's five specialized municipalities, two of them have branded themselves simply as municipalities in their official names, while two others have branded themselves as counties. The remaining specialized municipality has branded itself as a regional municipality. The use of the regional municipality term in the official name of the one specialized municipality has led to a common belief that a regional municipality is its own separate municipal status type in Alberta, which is not the case. Meanwhile, the use of the county term in the official names of two specialized municipalities and 46 municipal districts has partially led to a common belief that a county also is its own separate municipal status type, which also is not the case. The other major contributor to this common belief is that a county was a former municipal status type in Alberta prior to the County Act being repealed in 1995. An update to the MGA in 1994 legislated the ability to incorporate a specialized municipality "when no other classification of municipal government can meet the needs of residents of the proposed municipality." 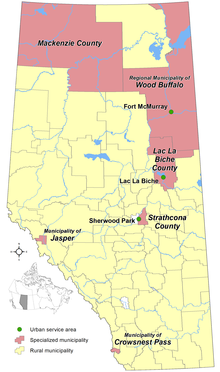 The incorporation of five specialized municipalities followed starting with the Regional Municipality of Wood Buffalo in 1995, Strathcona County in 1996, Mackenzie County in 1999, the Municipality of Jasper in 2001, and the Municipality of Crowsnest Pass in 2008. The first specialized municipality was created on April 1, 1995, when the former City of Fort McMurray amalgamated with Improvement District (ID) No. 143 to form the Municipality of Wood Buffalo. Specialized municipality status was chosen for the amalgamated municipality "to provide for the unique needs of a municipality including a large urban centre and a large rural territory with a small population." Upon incorporation, Fort McMurray was designated an urban service area, an equivalent to a city under the MGA, while the balance of the municipality was designated a rural service area, an equivalent to a municipal district under the MGA. The Municipality of Wood Buffalo was renamed as the Regional Municipality of Wood Buffalo on August 14, 1996. The second specialized municipality was incorporated on January 1, 1996. Strathcona County changed its status from a municipal district to a specialized municipality "to provide for the unique needs of a municipality that includes both a large urban centre and a significant rural territory and population." The status change designated Strathcona County's large urban centre, Sherwood Park, as Alberta's second city-equivalent urban service area, while its rural territory was designated a rural service area deemed equivalent to a municipal district. The Municipal District (MD) of Mackenzie No. 23 became the third specialized municipality on June 23, 1999. Previously a municipal district, it changed its status "to address concerns about municipal government and management in a municipality that serves a number of unique communities within a very large territory." Its unique communities include the hamlets of Fort Vermilion, La Crete and Zama City. The order in council that formed the MD of Mackenzie No. 23 as a specialized municipality included a clause to automatically change it back to a municipal district on November 1, 2001. This order in council was amended on January 30, 2001, at which point the clause to automatically revert its status was removed. The MD of Mackenzie No. 23 was renamed Mackenzie County on March 8, 2007. The Jasper Improvement District was established as Alberta's fourth specialized municipality under the name of the Municipality of Jasper on July 20, 2001. It was established as a specialized municipality "to provide for the unique needs of residents living within the municipality." The order in council that formed the specialized municipality defined the Town of Jasper as those lands within the Jasper townsite as described in Canada's National Parks Act. The Municipality of Crowsnest Pass was originally formed as a town on January 1, 1979, through the amalgamation of the towns of Blairmore and Coleman, the villages of Bellevue and Frank, and ID No. 5. After another amalgamation with ID No. 6 on January 1, 1996, the Municipality of Crowsnest Pass eventually had its town status changed to specialized municipality status on January 16, 2008. Unlike those of the four other specialized municipalities, no specific reason was provided in the order in council that changed the status of Crowsnest Pass. However, the motivation to become a specialized municipality was to enable membership in the Alberta Association of Municipal Districts and Counties for increased alignment with its neighbouring rural municipalities. Lac La Biche County changed status from a municipal district to Alberta's sixth specialized municipality on January 1, 2018. The County was formed on August 1, 2007 when the Town of Lac La Biche amalgamated with the surrounding Lakeland County, and in April 2015 it launched an investigation into the possibility of a change in status. By converting to a specialized municipality, the County was able to preserve the lower tax rates applied to its rural areas and the higher tax rates applied to the population centres of Lac La Biche (the former town) and Plamondon. Other municipalities that are investigating specialized municipality status include Spruce Grove, Morinville and Grande Prairie. Proponents of the Cooking Lake Airport have also expressed interest in breaking away from Strathcona County to form its own specialized municipality. Wikimedia Commons has media related to Main streets in Alberta. ^ Jasper's 2011 municipal census also counted a shadow (non-permanent resident) population of 652 for a combined population of 5,236. ^ Wood Buffalo's 2015 municipal census also counted a shadow population of 43,084 for a combined population of 125,032. ^ Statistics presented for six municipal districts (the Big Lakes County, the MD of Bonnyville No. 87, Lac La Biche County, the County of Northern Lights, Northern Sunrise County and Smoky Lake County) differ from statistics for their corresponding census subdivisions published by Statistics Canada to recognize that Alberta's eight Metis settlements, which are designated places located within these six municipal districts, are separate municipalities. The statistics presented for total municipal districts and total rural municipalities therefore exclude the statistics associated with the eight Metis settlements. ^ "Types of Municipalities". Alberta Municipal Affairs. Retrieved March 27, 2010. ^ a b "A foundation for the future of Alberta's municipalities". Government of Alberta. Retrieved April 25, 2015. ^ a b c "Municipal Government Act". Alberta Queen's Printer. Retrieved March 27, 2010. ^ a b "Population and dwelling counts, for Canada, provinces and territories, and census subdivisions (municipalities), 2011 and 2006 censuses (Alberta)". Statistics Canada. August 9, 2016. Retrieved November 5, 2016. ^ a b c d e f g h i "Municipal Profiles (Specialized Municipalities)" (PDF). Alberta Municipal Affairs. December 27, 2013. Retrieved December 30, 2013. ^ "Local Governance: A Short Review of Changes in Various Jurisdictions – Future of Local Governance Research Paper" (PDF). Alberta Urban Municipalities Association. March 2009. p. 2. Retrieved April 25, 2015. ^ a b c d "Order in Council (O.C.) 264/99" (PDF). Province of Alberta. June 23, 1999. Retrieved March 28, 2010. ^ a b c "Order in Council (O.C.) 817/94" (PDF). Province of Alberta. December 21, 1994. Retrieved March 28, 2010. ^ a b "Order in Council (O.C.) 761/95" (PDF). Province of Alberta. December 6, 1995. Retrieved March 28, 2010. ^ "Order in Council (O.C.) 54/2001". Province of Alberta. January 30, 2001. Retrieved April 25, 2015. ^ a b "Order in Council (O.C.) 279/2001" (PDF). Province of Alberta. July 7, 2001. Retrieved March 28, 2010. ^ "Order in Council (O.C.) 1/2008". Province of Alberta. January 16, 2008. Retrieved March 28, 2010. ^ "Municipality of Crowsnest Pass: Report on the Corporate Review". George B. Cuff & Associates Ltd. October 2009. Retrieved May 30, 2013. ^ "O.C. 259/2017". Government of Alberta. September 14, 2017. Retrieved October 11, 2017. ^ "Lac La Biche County". Alberta Municipal Affairs. August 2007. Retrieved November 9, 2007. ^ Alex Fuller (April 20, 2015). "Lac La Biche County pondering municipal status change: County considering switching from municipal district to specialized municipality". Lac La Biche Post. Great West Newspapers LP. Retrieved April 26, 2015. ^ "2015 Municipal Affairs Population List" (PDF). Alberta Municipal Affairs. ISBN 978-1-4601-2630-1. Retrieved February 21, 2016. ^ a b c d e "Population and dwelling counts, for Canada, provinces and territories, and census subdivisions (municipalities), 2016 and 2011 censuses – 100% data (Alberta)". Statistics Canada. February 8, 2017. Retrieved February 8, 2017. ^ "Population and dwelling counts, for Canada, provinces and territories, census divisions, census subdivisions (municipalities) and designated places, 2011 and 2006 censuses". Statistics Canada. January 30, 2013. Retrieved November 4, 2013. ^ "O.C. 259/2017". Government of Alberta. September 14, 2017. Retrieved December 31, 2017. ^ "Growth Study: Frequently asked questions". City of Spruce Grove. Retrieved February 19, 2016. ^ Tristan Turner (February 12, 2016). "Morinville Council Briefs". Morinville News. Pawn Marketing & Publishing Inc. Retrieved February 19, 2016. ^ Justine Kelsie (February 17, 2016). "Grande Prairie looking at becoming specialized municipality". My Grande Prairie Now. Vista Radio. Retrieved February 19, 2016. ^ Megan Voss (September 4, 2015). "Airport ready to fly the coop". Sherwood Park News. Sun Media Community Newspapers. Retrieved February 19, 2016. This page was last edited on 24 September 2018, at 13:14 (UTC).